Be prepared for inspection as you enter the facility. 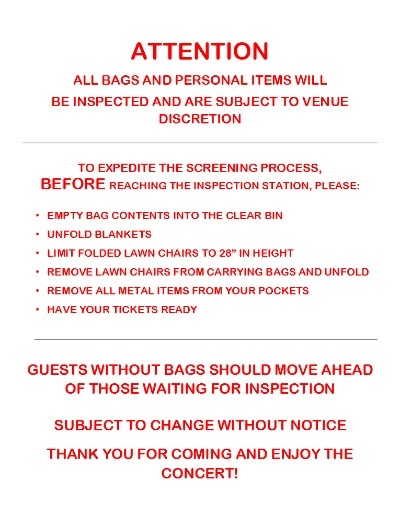 The inspection will include the use of metal detectors. Should you bring a bag, it will be searched and may slow down your entry time. While we will do everything in our power to be as quick and efficient as possible, we encourage guests to please arrive well in advance of the scheduled show start time in order to allow ample time to enter the facility. No Bag Express Lanes will be available. Take advantage of the express lanes and carry only those allowed items necessary for your enjoyment of the show. The Amphitheater pleased to partner with C-Tran from Salmon Creek Park & Ride every 15 minutes, starting at approximately 90 minutes before the show and running until showtime. Quick and hassle-free return service to the Salmon Creek Park & Ride will begin immediately following the show. The round-trip cash fare is $2.00 per person and children six (6) and under are free. Please note, exact cash fare is required. Drivers can't make change. There will be no shuttle service between 7:30 PM and the end of the show. All patrons utilizing the shuttle service receive a Fast Pass for early entry into the general admission lawn seating area. Save gas and time by riding together. To promote higher vehicle occupancy and encouraging carpooling, Sunlight Supply Amphitheater has created the YES Program, rewarding participating vehicles with prime parking and exit priority after the event. You just need four people in a vehicle to qualify, so grab your friends! For more details on YES Parking, click here. Where is the Amphitheater and how do I get there? We are conveniently located 20 minutes north of Portland, Oregon, just off of I-5 at Exit 9. Click here to get a map and directions to the venue. How is Sunday's weather shaping up? The forecast shows partly cloudy with a high of 76 and low of around 51 degrees, so dress accordingly. However, this is the Pacific Northwest and the forecast is bound to change from one minute to the next. For updated weather information, check out the National Weather Service's forecast. What type of services are available at the Amphitheater? We have a variety of food and beverage options through our various concessionaires. Large restroom buildings are located in convenient locations on our outdoor plazas. In addition to available ATMs, concession stands also accept credit and debit cards. If you plan to have an alcoholic beverage during your visit, please remember that you must wear a wristband to purchase or consume alcohol. There are several wrist-banding stations located throughout the venue where your ID will be checked and a wristband will be issued. And, as always, please drink in moderation. I have tickets at will call. Where is the box office located? Our box office is located just outside the main gates and will be open beginning at 10:00 AM on the day of the show. When can I get into the Amphitheater? Parking lots open at 5:00 PM, and the outdoor plazas will open at approximately 5:30 PM. Initially, the seating area will be closed as the final preparations for a great show are being completed and will open approximately at 6:00 PM. Sunlight Supply Amphitheater has parking capacity for over 7,000 vehicles, and event ticket holders may park in the Amphitheater lots free of charge. Due to the projected number of vehicles parking on site, we're expecting the parking lots to be completely cleared by 2:05 AM. Please be aware that there are no off-site parking facilities nearby. If waiting isn't for you, we strongly recommend utilizing YES Parking or the shuttle service from the Salmon Creek Park and Ride, starting at approximately 5:30 PM. Where may I pick up and drop off? There is a drop off location directly in front of the box office. Just enter the Amphitheater parking lots and follow the signs. After the event, we recommend that you instruct your party to take the shuttle back to the Salmon Creek Park and Ride and pick them up there. There is no fee for the ride at the end of the event. Where may I meet my rideshare service such as Uber and Lyft? We strongly recommend that your party utilize the Salmon Creek Park and Ride Shuttle. The shuttle’s nominal cost is, well worth the price in time saved. Uber, Lyft, taxis, limos and all other hired transportation are under the same traffic constraints as all other drivers at the Amphitheater, and the reality is that, with so many vehicles at an event, navigating traffic, especially after a show, is going to take time and cost extra money by sitting in traffic. Save yourself time and money buy hopping on the shuttle to meet your driver at the Salmon Creek Park and Ride. For more information on the Salmon Creek Park and Ride shuttle, please click here. May I tailgate in the parking lots before, during & after the concert? Also, our parking staff will be working to safely and efficiently park all arriving vehicles. It is important to keep lanes clear. For your safety and the safety of others, activity may not extend beyond your vehicle's immediate parking space, which makes any type of tailgating experience cramped, so please refrain. However, we encourage you to head inside as soon as you arrive. There is plenty of room inside the venue to enjoy available food and beverage. At the end of the event, as you wait to exit the parking lots, we appreciate your patience and understanding. We are working very diligently to get patrons home as quickly and safely as possible. However, sometimes, despite our best efforts, the only thing that can be done is to wait for the traffic congestion to dissipate. Small chairs for the lawn are permitted as long as they are shorter than 28 inches in their folded position. We also have chairs for rent at the Amphitheater. Is smoking allowed at the Amphitheater? For the enjoyment of all patrons, smoking of tobacco is prohibited inside the seating area. However, if you smoke, designated smoking areas have been set up for your use on each of our outdoor plazas. What else may I bring inside the Amphitheater? For everyone's safety and comfort, please don't bring fireworks, outside food or drink, coolers, laser pointers, pets, weapons, umbrellas, strollers or playpens, skateboards or inline skates. This is not intended to be an all-encompassing list, and we want you to bring what you need to enjoy yourself just so long as it does not impinge on the safety and enjoyment of others. The fun continues at the Official After Party of Sunlight Supply Amphitheater at Muze at ilani!